Contrary to what I'm listening to at the moment, this post is going to be rather... pink. Or at least, something in the red category. This is what it originally looks like in the tube, sort of pinkish. I bought it as a combo, with a lip balm and lip gloss in the same scent. The lip gloss comes with the standard doe-foot applicator wand. 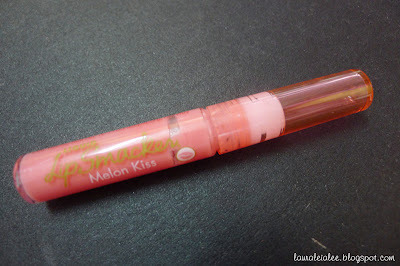 When I bought it, I thought it would smell like watermelon, but it turned out smelling like... honeydew? It didn't smell the way I expected it to, but still nice nevertheless. Liquid Lip Smacker in "Melon Kiss"
Swatches of the lip gloss before I start with the 'experiment'. Uh, I mean D.I.Y. 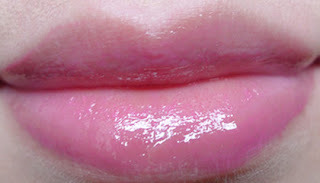 :P It has a pink tinge when seen in the tube and when swatched, but once applied on the lips it goes on completely clear. Now, we can start our little D.I.Y. 'experiment'! First, pop out the stopper at the mouth of the tube. The stopper helps to prevent the gloss from spilling out of the tube, and also wipes off any excess product when you pull out the wand. 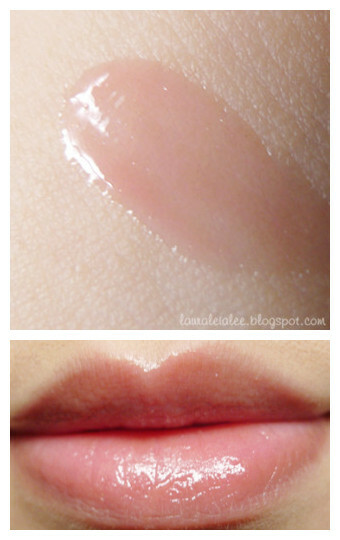 Now, take out the lip tar colour of your choice and drop a blob on a clean piece of paper. 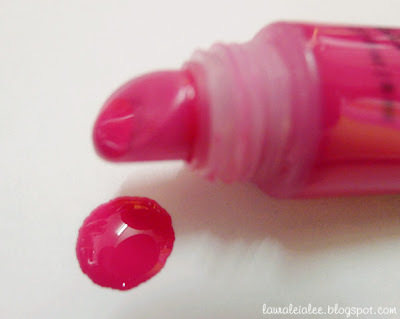 Just a small drop is enough, because they are super pigmented. 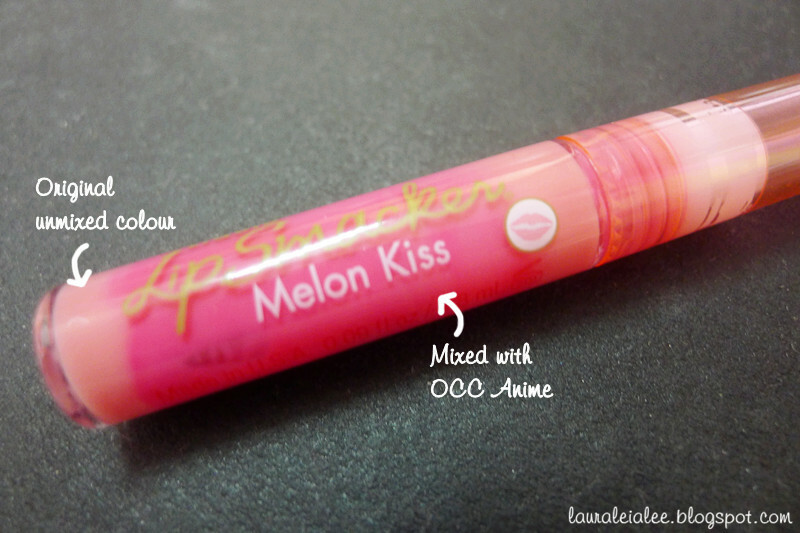 Here, I used my OCC lip tar in "Anime", which is a bright blue-based pink. Of course, seeing it inside the tube isn't quite the same as swatching it on the skin/lips, so here's what the gloss looks like after mixing with the lip tar. ...it's a pretty shade of pink. 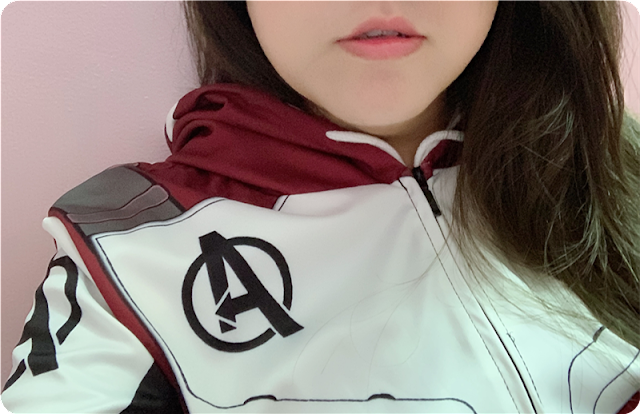 :) It looks light here, but in different lighting conditions it can look a bit darker. I love how the 'experiment' turned out! 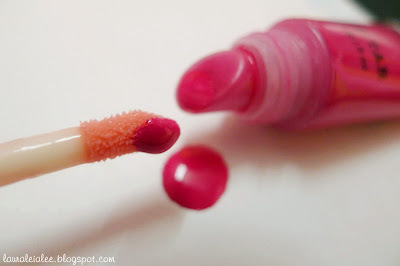 I now have my favourite deliciously-scented lip gloss in a nice pink colour, and the best thing is, once the gloss wears off I can still see a hint of pink on my lips because of the lip stain mixed in it! 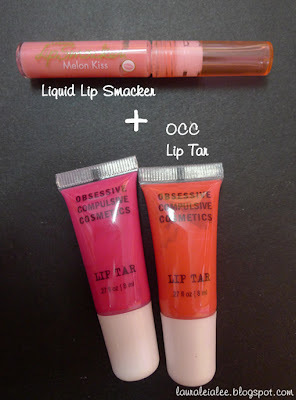 :D I have a good mind to go and grab more liquid Lip Smacker glosses so that I can mix up a few other combinations using my 2 OCC Lip Tars, lol. 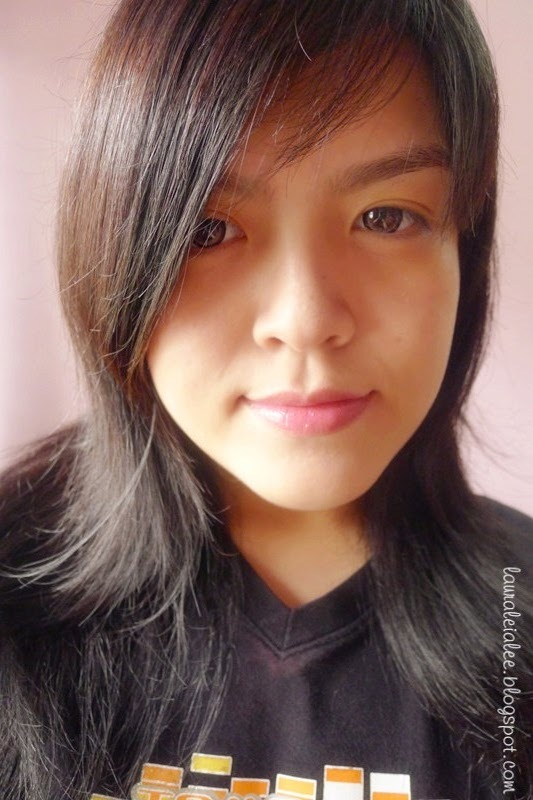 I swear, this photo was taken without makeup. The shade of pink that came out of the experiment is really lovely, suits you! 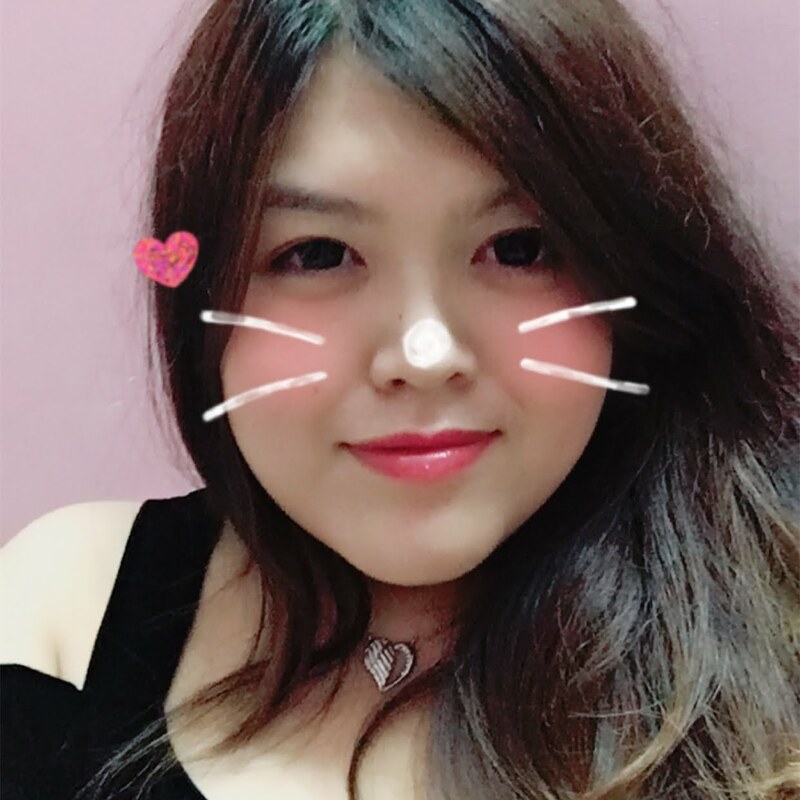 justychaaa: Thanks! I really want to mix some more, haha! 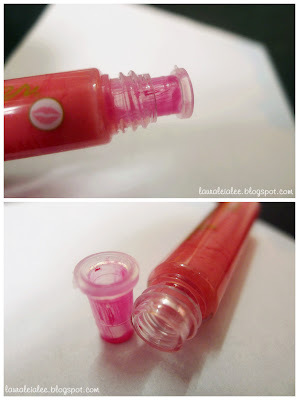 i love the swatches and how they look on your lips! really pretty! The color looks great on you :)I love the pink <3 Nice try. oh my what a great idea!love the colour.